At Eastside Dental Swansea, we provide dental veneers. Veneers are a cosmetic procedure used to improve the appearance of teeth i.e. colour or shape. 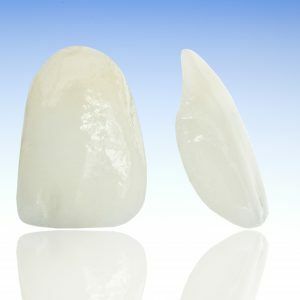 They are made from a thin layer of porcelain fitted over the front facing surface of the tooth. Think of it as false nails being applied to real nails. They are often used in pairs to provide a symmetrical appearance and can be constructed using either porcelain or composite resin. In cases where a large number of veneers are placed, a wax model can be produced to preview the finished result. In most cases, we try to ensure that the teeth are not cut and once fitted your veneers should last for many years.